Sizzling Hot Romantic Mystery Series! Anneliese Nottingham had it all. A fashionista with her own city apartment and a great job in a career she loved... until a friendly word to a VIP client got her fired and now she's about to lose everything. Leo MacKenzie is wealthy beyond imagination. One of Boston's elite, he's an ex-Marine with an exclusive detective agency for the rich and famous... but he keeps a dark family secret. Leo wants to forget his painful past and Anneliese isn't looking for love, but when the two of them are thrown together to solve a strange crime, the undeniable chemistry between them grows from an ember to a flame. With reputations at stake, will they keep it professional or give in to their desires? If you like female amateur sleuths, witty dialogue, bizarre crimes and steamy romance, then you'll love the first installment of Kate Benitez' romantic mystery series. 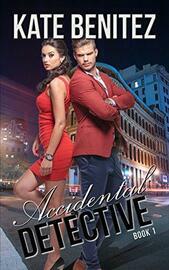 Discover Anneliese and Leo's crime-solving world and their smoldering romance in Accidental Detective!